I swear I'll have a real housewarming, but before that... We hope you'll join us for the new Monumental Reading series from Narrow House. 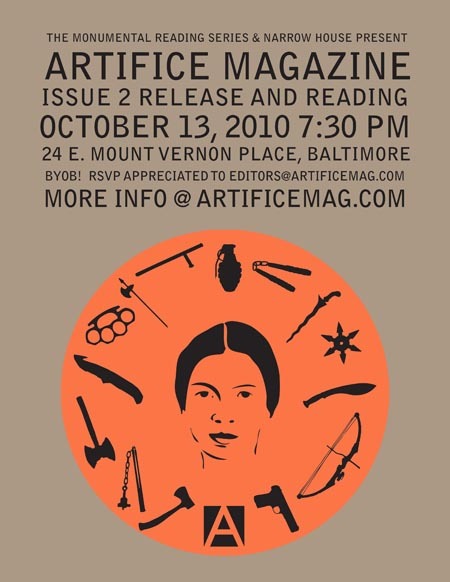 This sporadic series kicks off with a slate of readers from Artifice Magazine on their Issue 2 Release Tour. There'll be beer, fun, and friends, but feel free to bring more of all of those things! P.S. Narrow House's-own Lauren Bender will be reading on the same night, at the same time across town at the Worms reading. The scheduling gods are unkind, I know, but we're sure you'll make it to one even or the other. Here's the Facebook event for it.